During our travels visiting customers we have seen many different growing techniques and important steps to be taken before starting a new Saffron bulb crop. start with a fresh location without any prior cultivation for up to two years. 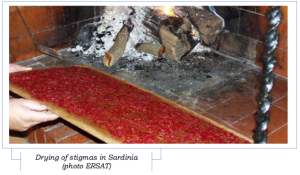 The most serious problems are those caused by the presence of Fusarium oxysporum funguses f. sp. Gladioli, Rhizoctonia croccorum and Rhizoctonia violacea Tul, as well as acarina Rhizoglyphus. 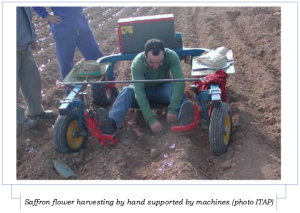 In Spain we have seen a Saffron bulb disinfection being carried out prior planting to mitigate the risk of fungus. 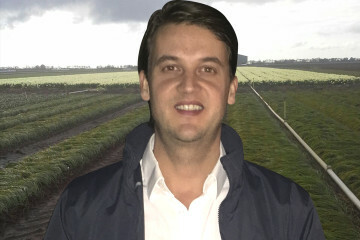 There are fungicide solutions available on the market nowadays also on an organic basis. It is important to dry the Saffron bulbs after the fungicide treatment. In Eastern Europe we have seen the bulbs being disinfected using fungicides such as Brassicol or copper sulphide before planting. The Crocus Sativus bulbs need to be stored in a dry, well ventilated environment. Saffron bulbs are still a product of nature and very much alive even though the bulbs seem dormant. Just like other dry flower bulbs such as Tulips & Hyacinths, Crocus Sativus bulbs need to be able to ‘breath’ when above the ground. When stored in a warehouse, open up the doors to provide fresh air and plenty of continuous air movement. Saffron bulbs stored under the wrong conditions become sensitive for fungus which could impact your crop. The best storage Temperature would be between 20-25 degrees Celsius (70-80F). Preparing the Saffron field is a task of preparing the field for a cultivation of multiple years harvesting on the same field. The soil is being prepared by using tractors and a vibrating cylinder to loosen up the soil. In the U.S.A. with the Amish community in the state of Pennsylvania we have seen cultivation preparation being carried out by horses. 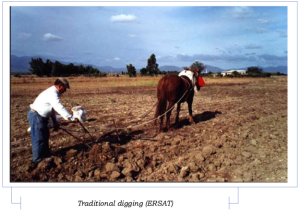 We have seen adding an organic a fertilization of 20 – 30 kg per hectare of matured manure. Afterwards, certain chemicals could be used like phosphor and potash according to a research conducted by the EU agricultural department. The planting depth of Crocus Sativus is important and has a great impact on the flowering yield. In Spain & Italy the most common planting depth of Crocus Sativus would be 15 to 20 CM (6 to 8 Inches). Planting density determines the capacity for reproduction of the Crocus Sativus bulb. Reproduction of Crocus Sativus is the process where small bulbs are being formed around the ‘mother’ bulb. The new smaller ‘daughter’ bulbs will all produce flowers, hence increased yield of Saffron stigmas. For a production of up to 4 years we noticed a planting density in Spain and Italy of 15 CM (6 Inches). This planting density comes down to approximately 60 bulbs per m2 by using a 10/+ CM size of Saffron bulb. Basically, planting 600,000 bulbs per hectare is a fair estimate to prepare a planting schedule. Saffron bulbs thrive well under extreme weather conditions. Saffron bulbs like cold winters combined with hot and dry summers. In the Spring time when the reproduction of the Crocus Sativus occurs and flowering time in the Fall are the times when the Saffron crop could use water. All other periods during the year Saffron bulbs requires low quantities of water. It is important to reduce the weeds from the land. Weeds can disturb the reproduction process and potentially bring in potential deseases. In most countries the weeds are still removed by hand. In case of mechanical weed removal, be careful as not to damage or harm the Saffron bulbs. In most cases professional Saffron growers prepare the land about one month prior the flowering season of Saffron. Usually the month of September is being used to remove all the weeds and the surface of the soil is being grubbed in order to break the crust. It is important to plan and prepare well for your Saffron harvest. The flowering period of Saffron flowers is short and flowers could lose their properties once the Saffron flowers are exposed to bad weather conditions for a longer period of time. Flowering periods of Saffron flowers depend on climate conditions. We see in La Mancha, Spain the flowering starting mid October. The flowering period of Saffron flowers usually last for about 10 - 15 days. 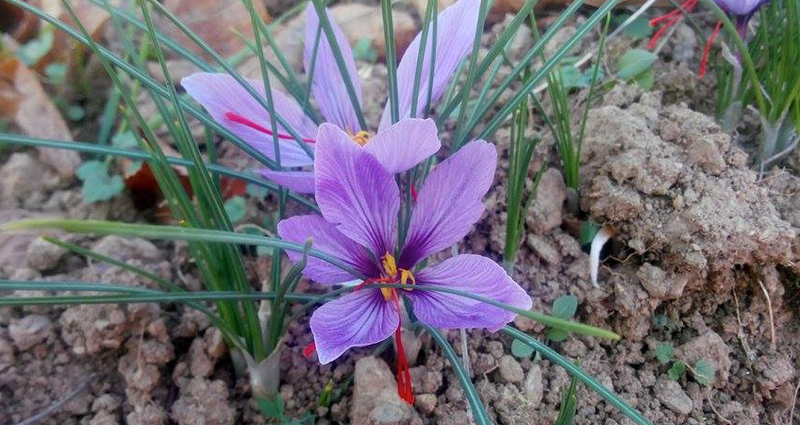 The majority of the Saffron flowers are harvested the first five days of flowering. 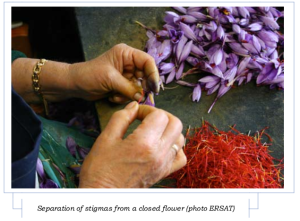 Although we are living in modern times, the tradition of harvesting Saffron flowers tells us that in most cases the harvesting is still being carried out by hand. The Saffron flower is cut at the lower part of its corolla. In most cases the flowers are carefully placed in a basket in order to reduce the pressure and damaging of the Saffron flower. The price of Saffron also mainly depends on the cost of harvesting, estimations tell us that an average worker is able to harvest and collect 8 to 16 kg of flowers per day. 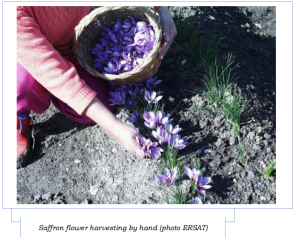 Harvesting the Saffron flowers is a time consuming job and it can definitely impact the yield of your Saffron harvest. 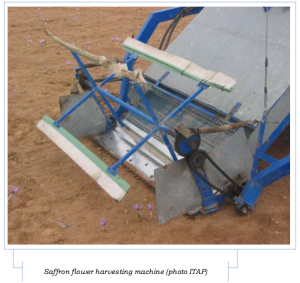 We have seen different methods of harvesting whereby the worker is being placed in a more convenient position for example lying or sitting while being able to collect the Saffron flowers. 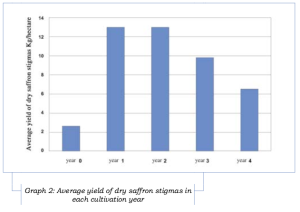 All these enhanced growing and harvesting techniques have an influence on the Saffron yield. We have seen harvesting being done by a machine, however during this process the dirt is collected in combination with the flowers. The dirt could harm the Saffron flower and its stigmas and thus could cause a certain loss of your Saffron harvest. Can you give me an email address to come in touch with you? I have saffron in Greece and i have some questions.